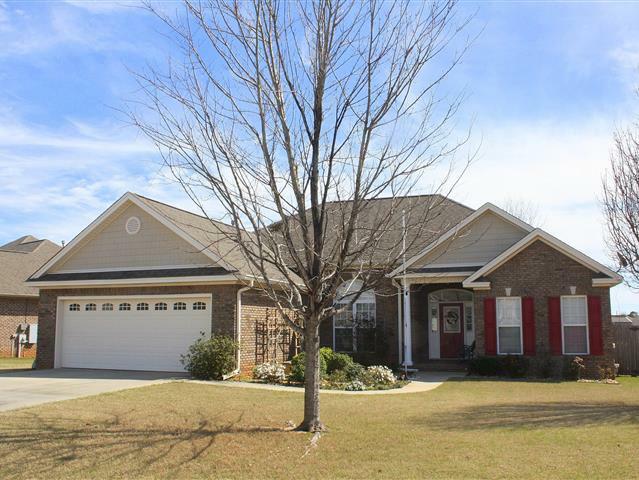 Bridge Creek Reserve Subdivision in Prattville. 4 Bedroom, 2 Bath "flex plan" comes with a bright 12x12, vaulted sunroom that adjoins the huge covered patio and makes for a great office/media/exercise room or the 4th bedroom! This free-flowing, energy efficient design offers 2000+ sq ft living plus a double garage with interior storage room. Amenities include: architectural shingles, designer brick, decorator glass door, 2" faux blinds, rich wood floors, ceramic tile flooring in kitchen and breakfast room, Corion solid surface countertops, tile backsplash & breakfast bar, stainless appliance package, volume ceilings in family room and master bedroom, upgraded carpet, lighting and plumbing fixtures, ample crown molding, smooth painted ceilings, ventless gas log fireplace, ceiling fans in all bedrooms, split bedroom plan promotes privacy, master suite with jetted garden bath, double vanity, Large separate shower with seat & a room-sized walk-in closet, XL covered patio with brick paver surface & another uncovered patio for your grill, security system, nicely landscaped yard with underground sprinkler system and big backyard with full privacy fence! Come see how much more you get in upscale Bridge Creek Reserve.